How does one actually become a member of Christ Church? As Elizabeth Barrett Browning writes, "Let me count the ways." At Christ Church, we regularly baptize infants and children, as well as youth and adults. Anyone baptized at Christ Church is automatically listed as a member of Christ Church. For youth who were baptized as infants or small children, we offer a Confirmation Class (most recently led by Samantha McKean and a team of adult mentors) where middle and high school students are invited to make a public profession of faith by being presented to the Bishop for Confirmation. The students are confirming or reaffirming their baptisms, demonstrating a mature declaration of faith. All youth confirmed at Christ Church are listed as members of this congregation, unless they are already members by Baptism. If an adult was baptized and/or confirmed at another Episcopal Church, she or he can contact the Church office and request the membership be transferred from a previous congregation to Christ Church. As an Episcopal Church, we are very ecumenical in our understanding of the Christian faith. If someone was baptized in another denomination (or non-denominational Church), we recognize that Baptism as fully valid and do not "re-baptize" people. Anyone who was baptized in any Christian Church may simply ask to be listed as a baptized member of Christ Church. However, in this scenario, we do ask people to prayerfully consider being Received into the Episcopal Church when our Bishop makes his next Visitation. On this day, the group of new members is formally presented to the Bishop, and he lays hands on the head of each person as he says a prayer which includes, "We receive you into the fellowship of this communion." This is a public liturgy that honors the faith heritage of previous Church affiliations while sacramentally "receiving" folks into this community. What if I am an adult baptized member, and I decide not to be formally Received? While every baptized person is considered a full member of the Body of Christ, there are certain roles in an Episcopal Church, such as serving on the Vestry and serving a chalice at Communion, that are historically reserved for those members who have been Confirmed or Received into the Episcopal Church. 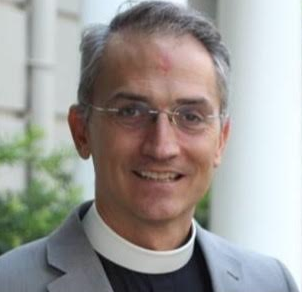 On Sunday, October 7, The Right Reverend Scott A. Benhase, Tenth Bishop of Georgia, will make his Visitation to Christ Church for our 10:30 a.m. service of Holy Eucharist. At this service, we will present our Youth Confirmation Class to be Confirmed and all adults desiring to be Received into the Episcopal Church will be presented for a Prayer of Reception. The Youth Confirmation Class began in January. For those adults who desire to be Received, the rector is offering a class, Welcome to the Episcopal Church, on Sundays, September 16, 23, and 30 (the three Sundays before the Bishop's Visitation) at 9:30 a.m. in the Parish House. This class which will be offered at the same time as our regular adult Sunday School class and is only for those adults who will be Received on October 7th. If you have any questions, or if you are open to being part of this class, please contact the rector, The Rev. Michael S. White, michael.white@ccesavannah.org .